All photographs courtesy of and copyright Roberto Masotti. Click on a thumbnail to see an enlarged image. 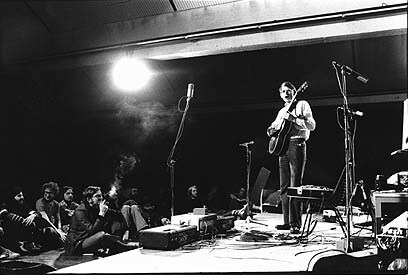 Roberto Masotti's photographs show Derek Bailey circa 1975 in Berlin. 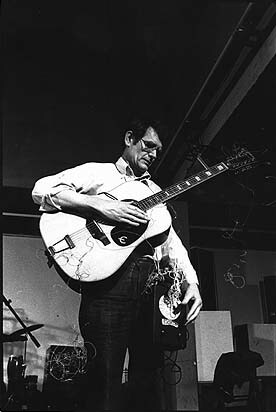 Bailey has brought one guitar on stage in a case fitted with a chain wired to an amplifier (first photo). 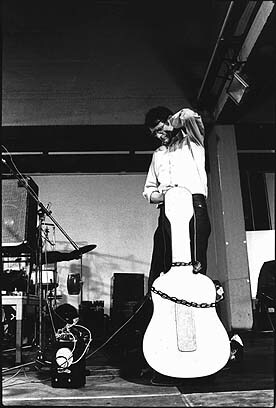 Thus any movement of the chain like, for example, taking the guitar out of its case, would cause the sound to be heard by the audience (second photo). 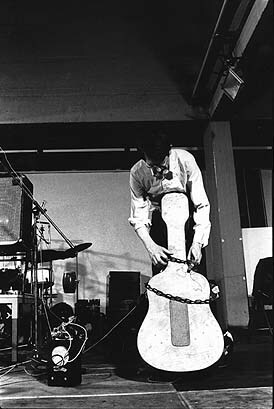 The third photograph shows the guitar released from this environment but enmeshed with other strings and wires: one version of the 19 (approx) string guitar. On the final photograph a second guitar can be seen - lying flat on a chair, both being used simultaneously at times. "In the late 60s/early 70s I occasionally used bulldog clips etc. attached to the strings - all standard preparations at the time. Later I adapted a guitar - an Epiphone - for these purposes. This was the '19 string' (approx) guitar. The guitar had an internal mike attached to the practice amp. Additionally there was a longish wire/string that kind of trailed behind to which might be attached all kinds of things (on the recording 'Domestic and public pieces' the instrument pops up here and there and on that particular concert there was an amplified thunder sheet attached to the long string). The whole thing was of course mobile. Toward the end of the seventies I dumped it, finding that I prefered to look for whatever 'effects' I might need through technique."